Mama Q exemplifies the stylish woman in her '70's. 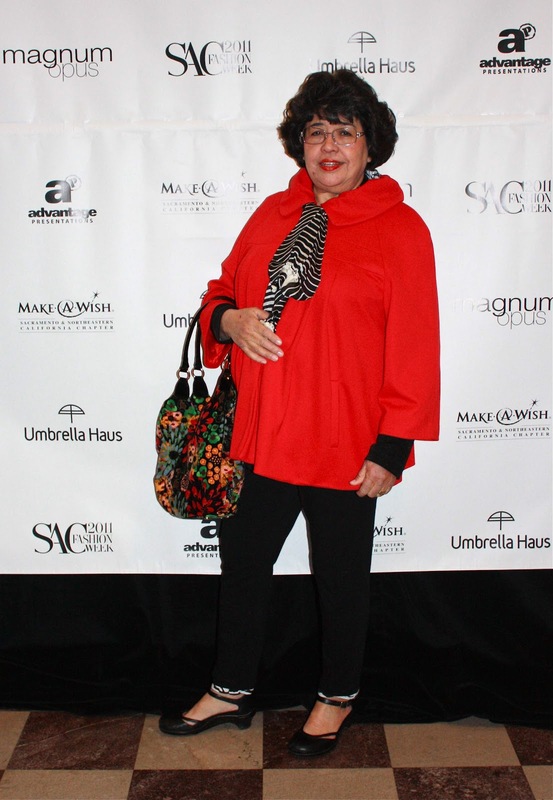 Who better to attend Sacramento Fashion Week with me than my premier style maven, my Mama Q? Seen posing here for the paparazzi (ok, it was just me, her daughter with her trusty Canon Rebel Xsi) my mamacita was stoked to be attending her first ever fashion show. We dolled up, sipped pre-show cocktails at Ella's and had a blast. Mama Q is a perfect example of ageless style. Turning 70 this year, Mama still loves to express herself in her way of dress. Self-taught, Mama Q sewed her first dress when she was 19 years old; it was for a dance. She used to love going to dances and would make herself a new frock to wear every week. She has had a life-long love affair with color: favoring big bright colors- the bolder, the better for her, as shown here in her gorgeous cardinal red wool swing coat. Never afraid to try something new, my Mama is less interested in "what's in", and more into expressing "what's inside." She loves to make her style her own, and if you look closely you'll see added zebra print trim on her pants, and blouse. Everything but her shoes come from second-hand shops. The shoes were a recent purchase she bought to use as her walking shoes for her recent trip to Turkey. Mama Q LOVES to travel and is pretty much game for any adventure that strikes her fancy. Maybe that's the secret to looking young- an adventuresome and cheerful spirit! I LOVE this!!! Ah-dorable, Mama Q!! She looks stunning. Glad she enjoyed it. Nice to meet your Mum - I love her red coat - my Mum used to sew too and I learnt a lot about clothes from her! Bella, you are blessed with fabuluos fashion genes. Mama is very stylish and I agree with her phylosophy that what matters is not "what's in", and more into expressing "what's inside." She is 70?! Amazing! Admiring the swing coat and the shoes. Want to hear more about her trip to Turkey! GORGEOUS!!! Oh I am so jealous! How wonderful that you and your gorgeous Mama went to the show together. I LOVE her coat! What an amazing inspiration your mama is! I love those shoes - what a sweet heel. That's your MAMA? Wowee! Now I know where you get your creative original spark from! She's fabulous! And did you say she's turning 70?! She looks so young and stylish and awesome. Thanks for sharing your fabulous mother with us!! I love that you featured your mom! How is it that your mom (and you) are so young looking? Please, it's time for a beauty secrets post! Vivienne Westwood says all the best street style is worn by people in their 70s. Your mom's just coming into her fashion prime!